Quality of health is important to everyone these days however, we tend to overlook one important fact – clean air that’s free of allergens, dust and other impurities. The main reason I started this website was to raise awareness about the importance of clean air. I believe that just like you would take care of your heart by exercising, you should take care of your respiratory system by purchasing an air purifier, and the Whirlpool AP51030K Whispure Air Purifier with HEPA Air Cleaner is definitely worth looking into. Whirlpool is one of the best known brands of household appliances, and I wasn’t the least bit surprised when I found out they make fantastic air purifiers as well. This model has a 3-Stage filtration system consisting of a pre-filter, activated carbon filter and True HEPA filter. It’s also characterized by user friendly electronic controls, quiet operation, adjustable fan speed, built-in handle, and some market leading performance figures! The unit’s outside grill is the first part of the filtration stage which captures larger particles. Those that make their way inside are faced with the second stage which is the active charcoal filter. The carbon filter has an additional function which is to capture odors, fumes and gases. The first two stages make sure that your home is free of dust, lint, pet hair and allergens. Finally, the air is filtered by the True HEPA filter which is able to capture 99.9 % of irritants as small as 0.3 microns in diameter. Airborne particles such as mold spores, dust mite debris and pollen, as well as some viruses and bacteria are completely eliminated. The other benefit of true HEPA filtration is it doesn’t produce ozone which can form compounds that are harmful to human beings. The Whispure AP51030K features 4 different fan speeds which include sleep and turbo modes. One of the best things about this air purifier is how quiet it is, even when set on high. The loudness ranges from inaudible to white noise which means it’s suitable for use in a bedroom. The unit can filter air in rooms up to 500 square feet in size which makes it perfect for large living rooms or other “airy” spaces in the home. Its CADR rating is the best in its class, with 315 cubic feet of clean air delivered every minute (pretty high taking into account the price). The purifier’s ACH rating of 4.8 changes per hour is even more impressive considering how much area it covers. The Whirlpool Whispure uses 115 watts of power, slightly more than its competitors’ so it does have a tendency to produce a lot of heat. Incidentally, this is about the only negative thing I was able to dig up. It also comes with a 5 year warranty which goes to show how much Whirlpool believes in the quality of their products. The design of this particular air purifier features simple, elegant lines, and it will fit in just about anywhere without looking out of place. Its electronic controls are incredibly easy to use so operating it is a breeze. Thanks to its filter life indicator, you no longer have to guess when it’s time to clean or replace the filters. The Whispure’s price tag might seem a bit steep at first, but since this model is top of the line I think it’s quite a bargain. The Whirlpool Whispure is one of the most sophisticated and impressive air purifiers I have come across so far. 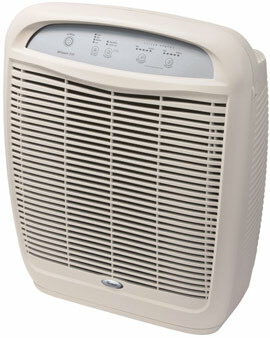 Apart from its tendency to double as a heater, there is nothing on this unit that isn’t top-notch. Its whisper like operation, outstanding CADR and ACH ratings and filtering capability make the Whispure AP51030K one of the best air filters around. Yes, it may cost more but with such impressive features and performance, I believe it to be worth every penny. If you’re interested in finding out more, feel free to take a look on Amazon.